Guests and dignitaries inspect the newly installed Automated Weather Station in WMSU-San Ramon Campus. 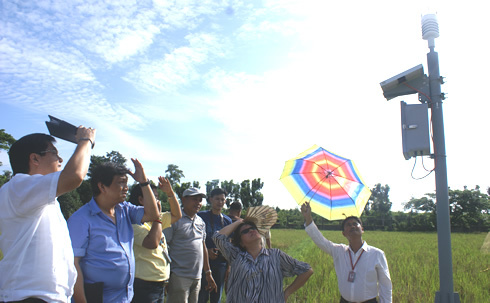 Department of Science and Technology (DOST) successfully installed an Automated Weather Station (AWS) in Western Mindanao State University-San Ramon Campus in Sitio San Ramon, Talisayan of this city. The installation, turn-over and inauguration ceremonies were held last June 28. Philippine Atmospheric, Geophysical and Astronomical Services Administration (PAG ASA) Region IX Chief-Maribel Enriquez, Assistant City Planning Administrator-Rodrigo Sicat and Assistant City Administrator-Elmeir Apolinario coheaded the event. The installation of the equipment was made possible through the DOST in coordination with the local city government. In turn, the city government turned over the equipment to Western Mindanao State University President-Dr. Grace Rebollos. During the ceremony, Dr. Rebollos expressed that the university is honored to have the responsibility to take care of the project. The equipment will not only strengthen the capacity of a certain area to generate advance information necessary to provide early warning information but it also adds to the capacity of the university for research, weather monitoring and for other possibilities in the College of Agriculture and College of Forestry and Environmental Studies. AWS is equipped with sensors, capable to obtain information within 50 kilometers radius. It is capable to generate various required parameters such as rainfall amount, temperature, air pressure, humidity, wind direction and wind speed every 15 minutes. It also has a GSM/GPRS modem to transmit data to PAGASA main office in Quezon City. Data gathered through time are accessible through a website maintained by the central server. AWS was sponsored and is managed by the DOST, PAG ASA and DOST- Advanced Science and Technology Institute (DOST-ASTI). The equipment is deemed useful for the local government in its disaster preparedness and to facilitate issuance of weather advisory to the local folks. Communities in turn, will have a more preventive response to emergency situations. AWS will also address important areas in agriculture such as in crop rotations and other agricultural developments.